The American Baby Bust: Why are Americans not having kids? “There’s a lot of concern about why today’s young adults aren’t having as many children. So we asked them,” The New York Times writes. 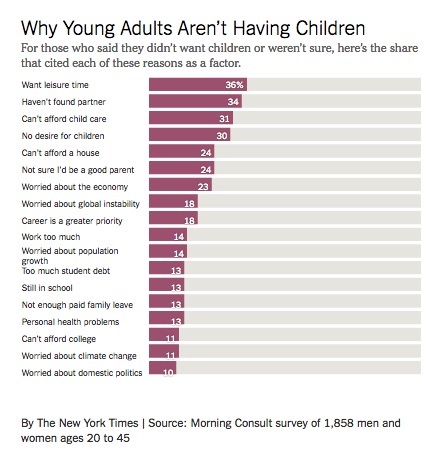 The Times commissioned the Morning Consult to survey young Americans to find out why they aren’t having kids. The total fertility rate — which estimates how many children women will have based on current patterns — is 1.8, below the replacement level in developed countries of 2.1. More than half of the 1,858 respondents of men and women between the ages of 20 and 45 said they planned to have fewer children than their parents. Roughly half surveyed were already parents. Of those who weren’t parents, 42 percent said they wanted children, 24 percent said they didn’t and 34 percent said they weren’t sure. aren’t sure they want children. 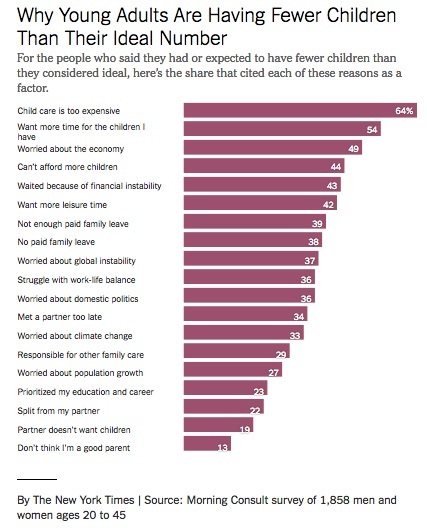 Of those who had children, most of the respondents said they delayed or stopped having children because they were concerned about not having enough time or money to adequately provide for them. 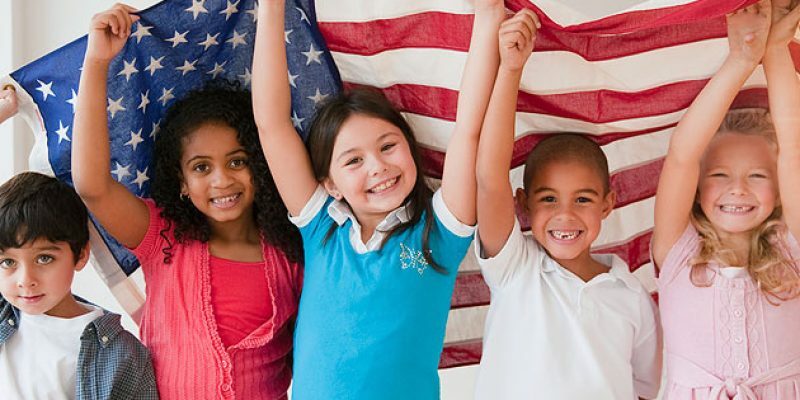 Of those who don’t plan on having children, 23 percent said it was because they were worried about the economy, one third said they couldn’t afford child care, 24 percent said they couldn’t afford a house, and 13 percent cited student debt.